Surgical procedures are performed at Critter Fixer Veterinary Hospital every day of the week, although it is preferred that we keep elective surgeries for Monday-Saturday. An appointment is advised. We ask that all patients check-in between 7-9 am on the morning of the scheduled surgery, and please allow for at least 15 minutes to meet with a veterinarian. 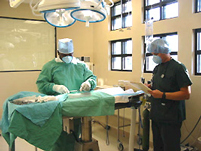 The owner, or authorized agent, dropping off an animal for surgery must be at least 18 years old. It is important that no food be given after 11:00 pm the night before; please also limit water intake. Vaccines are required to be current for all patients having surgery.